A climate appropriate garden is a beautiful garden! Now that 2015 is waning and lawn replacements rebates are uncertain (in Santa Clara County, as of this writing) there are plenty of reasons to go ahead with your lawn replacement projects. I hope to continue to see more people taking action to replace high water-use gardens with climate appropriate ones. 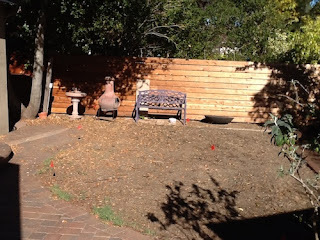 The current severe drought has forced us to rethink our gardens, and it's been a liberating experience for many. Several of my garden design clients have been very pleased and excited by their new water-saving gardens that offer flowers and seasonal beauty to enjoy, as well as fresh herbs for the kitchen. I have the impression that many homeowners (especially non-gardeners) have traditional lawns as default landscaping, since it's difficult to figure out what to do otherwise. Besides the water savings, a huge bonus is not having to mow and fertilize a high maintenance lawn. A careful selection of appropriate plants leads to a low maintenance garden- that's also liberating! But even if a patch of lawn is desired (for example, in a kids play area), there are several alternatives to conventional high water-use turf. See the Delta Bluegrass website to learn more. Native grasses offer seasonal beauty and elegance, but are not yet as tough as varieties that have been bred to withstand lots of foot traffic. In the photos above, a garden we installed last May has grown to be a lush pollinator garden with native and ornamental sages, plus prolific culinary herbs for the kitchen (near the recirculating fountain, above). 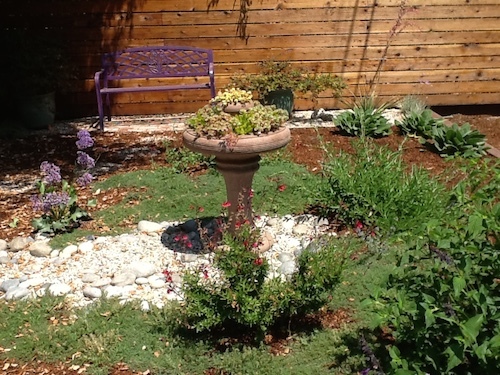 A discarded but very nice pedestal fountain in the photo above was repurposed into a charming succulent planter by drilling holes into it so that irrigation tubing could be put in place (top photo). 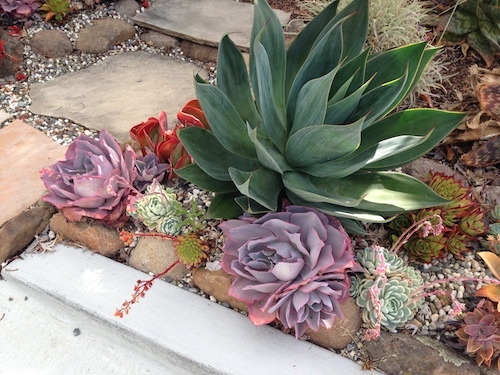 Succulents (as a group) are a great choices for low-water gardens. This group includes sedums, agaves, echeverias, sempervivums, aloes, as well as cacti. Nurseries have greatly expanded their offerings of succulents to meet the current demand. The image below demonstrates the drama and color that succulents bring to the garden. The good news is that if you are ready to rethink your conventional landscape and make a liberating shift to a more climate appropriate one, there are more resources than ever to help you make the transition.